The Board delegates certain functions and activities to executives or committees, some of which involve directors. The Directors’ Committee is responsible for upholding Art. 50 bis of Law 18,046. Examined, and voiced no observations about, the independent auditors’ report, balance sheet and other financial statements addressed to shareholders of Grupo Security and its subsidiaries, as of December 31, 2017. The audit partner from Deloitte and the Corporate Chief Accounting Manager from Grupo Security also participated in this meeting. Requested bids for external auditing services for 2018 from the following audit firms: (a) Deloitte; (b) KPMG; (c) PwC and (d) EY. These firms are among the most important audit firms in both the international and local markets. After evaluating the proposals received from Deloitte, Price, KPMG and EY, the committee agreed to propose to the Board of Directors, for it to in turn propose to shareholders at the ordinary shareholders' meeting, Deloitte as its first option as external auditors for Grupo Security and subsidiaries for 2018, and KPMG as its second option. a) Experience with and knowledge of the Group's business areas, especially in auditing banks, insurance companies and other financial companies in Chile. d) Suitable technical skills and partner experience with risks addressed by IFRS. e) Value, coverage and scope of service. Recommended that the Board of Directors of Grupo Security S.A. propose that the shareholders reappoint Fitch Ratings and ICR as risk raters. Approved the committee's annual performance report for 2017 to be presented to the Board of Directors and included as a note in the Company's annual report in accordance with Art. 50 Bis of Law 18,046. Was briefed on the Annual Internal Auditing Plan for the year 2018 for the Group and its Subsidiaries. Reviewed and approved the Annual Internal Auditing Plan for the year 2018 for the Group and its Subsidiaries, its main scope and risk approaches. Reviewed the Annual External Auditing Plan for 2018 prepared by Deloitte for Grupo Security and subsidiaries, which includes the Management Report (internal control evaluation), the Auditor's Report on the Financial Statements as of December 31, 2018, the Interim review report as of June 30, 2018, and other reports such as: the Provision Adequacy Report (methodology and calculations), the Report on Chapter XXI, the Report on Internal Control Law 20,712 (Single Funds Law) and Ruling 1441 on insurance, the Report on Ruling 1962, as well as the schedule, the assigned team and principal audit focuses for 2018, all with a risk-based approach. Reviewed and monitored efforts to prevent money laundering, fraud and bribery of public officials and was briefed on reports received through the reporting hotline and progress in training on Laws 20,393 and 19,913. It also monitored the biannual process to renew certification under Law 20,393 for Group subsidiaries. Regularly reviewed the most important operational, technological, compliance and credit risks as identified through comprehensive risk management and implemented at each subsidiary. Periodically reviewed loss events and claims reported by the Group's various companies. Regularly reviewed compliance with annual internal auditing plan for the main audit findings from Grupo Security’s businesses and companies, as well as ensured that commitments arising from the audit are resolved, with special emphasis on enforcing action plans, especially those that are behind schedule. Reviewed regulatory changes made by regulatory bodies during the period. The committee dedicated particular time to the proposed response to the "Corporate Governance Self-Assessment as of December 2017" questionnaire referred to in General Standard 385 issued by the SVS (presently CMF). Reviewed Operational Cybersecurity Incidents that occurred at other local banks. Reviewed the Consolidated Statements of Financial Position for Grupo Security S.A. and subsidiaries as of and for the period ended June 30, 2018, and the independent auditors’ report on the Interim Consolidated Financial Statements. The audit partner from Deloitte and the Corporate Chief Accounting Manager from Grupo Security also participated in this meeting. Reviewed the implementation and training schedule for the updated version of the Code of Conduct. Reviewed compensation and incentive plans in place for Grupo Security managers, key executives and other employees. Examined the Management Report issued by external auditors Deloitte on November 29, 2018, which includes observations on the Group and its subsidiaries arising as part of the financial statement audit as of December 31, 2018. Reviewed transactions between related parties, subsidiaries and associates of Grupo Security, as reported by them. In particular, the Directors’ Committee verified compliance with the General Transitory Policy on Ordinary Customary Transactions with Related Parties, approved at Board meeting 211 on April 29, 2010, and the subsequent amendments made by its subsidiaries. The committee verified that the policy has been fully upheld. Other topics of interest to the committee and matters regarding internal auditing. The committee did not make any recommendations to the shareholders. Compensation for attendance: UF15, budgeting for 12 meetings per year. This per-meeting compensation has not changed over the last three years. Expenses: This committee did not incur any administrative or consulting expenses in 2018. The objective of this committee is to regularly review the implementation of strategic plans for each Group company and the corporate services division, and report to the Board of Directors. Analyze company results, opportunities and challenges arising from technological, commercial and financial issues. Increase the visibility of strategic plans that impact the Group's medium and long-term results. In 2018, the committee analyzed the Risk Management Model implemented at Grupo Security and subsidiaries, and the potential capital requirements for the Bank as a result of implementing Basel III standards. Together with the Directors’ Committee, this committee is responsible for informing the Board about compensation issues. Examine the compensation systems and plans for executives, managers and employees. Encourage a conservative approach to risk within the organization, which is in the best interest of the shareholders and the general public. This committee focuses on the planning and control of financial and commercial management for the Group companies, and monitors corporate strategic initiatives. Define and supervise implementation of the corporate expense control policy and budget scheduling. 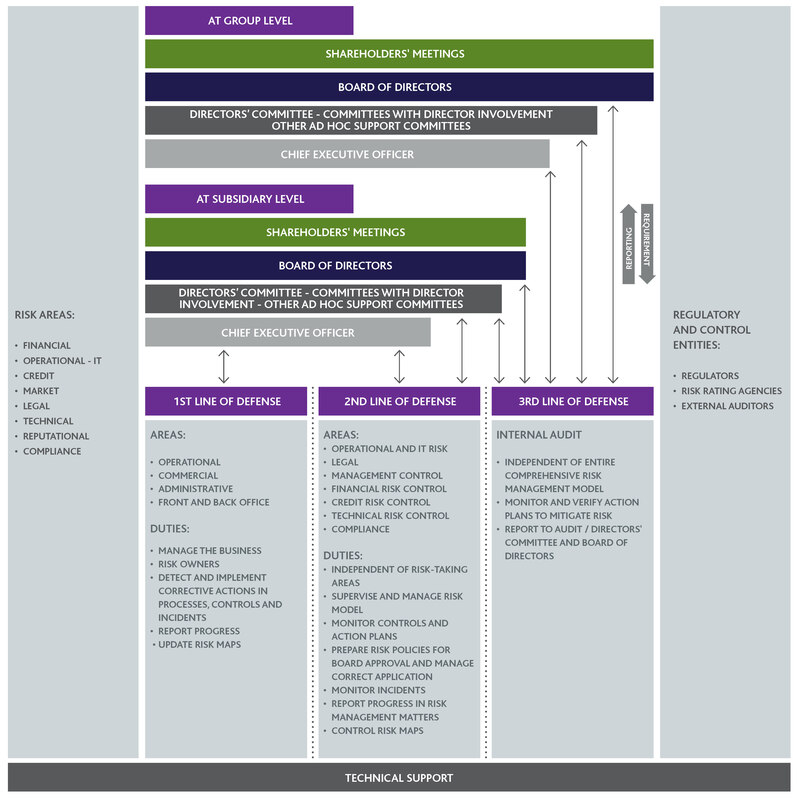 Manage the corporate governance model. This committee is focused on brand control and customer experience activities, based on metrics that are monitored through committees. It meets every three months. Define and monitor company plans, and verify their alignment with corporate objectives and strategy regarding marketing, quality and business intelligence. Define and control the quality models implemented in all companies, and verify their alignment with the Security Customer Experience Model. Structure and monitor a common model for processing requests, complaints and claims. Define, monitor and control implementation of the Comprehensive Customer Value Proposition Model. Protect the Security brand in each subsidiary. This committee fulfills a key role in defining and implementing operational and IT processes. Plan and monitor operating and technological issues. Review operational and technological continuity. Analyze, plan and evaluate IT projects. This committee is led by the Controller, whom the Board has appointed as responsible for crime prevention. The remaining committee members are the compliance officers at all Group companies and representatives from the Corporate Compliance Department. Plan, coordinate, set and monitor guidelines to ensure that the policies and procedures established in the Group's Crime Prevention Model are fully implemented and operative, in accordance with Law 20,393 and its amendments on the Criminal Liability of Legal Entities.